The PBJ & Jazz series returns this weekend with the Aaron Scott Trio and special guest saxophonist, Bryan Olsheski. PBJ & Jazz concerts are 1-hour long interactive concerts designed to introduce jazz and American music to young children and their families. PBJ & Jazz concerts are hosted by former Columbus Music Hall owner and retired music educator Rebecca Ogden – and are a great introduction to live music for the youngest audience member. PBJ & Jazz at the Topiary Park concerts are free and follow family storytime at 11:00 AM at the Main Library. Guests are encouraged to bring a picnic and a blanket. The noon concert will conclude with a hands-on art activity, from 1:00 – 2:00 PM, presented by the Columbus Museum of Art. 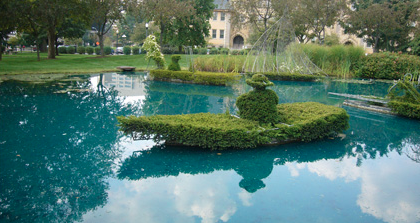 The Topiary Park is located at 480 E. Town Street in downtown Columbus. Aaron Scott is a first call musician in the Columbus area performing and teaching percussion for over 30 years. He has taught at Columbus Pro Percussion, Capital University CommunityMusic,MusicRoyale, Dublin Schools and Newark Schools doing group and individual lessons. You can currently find Aaron at the new Vaughan Music Studios facility in Upper Arlington. Aaron’s varied background and knowledge of many musical styles affords him the ability to move seamlessly from teaching rock/pop/latin/ jazz drumset, marching and symphonic band percussion as well as all O.M.E.A solo and ensemble percussion. Bryan Olsheski is a top call saxophonist in Columbus and has shared the stage with some of the most famous names in jazz such as Joe Henderson, Kenny Garrett, Wes “Warmdaddy” Anderson, Conrad Herwig, Jack McDuff, Slide Hampton and George Benson. He has also been a featured soloist for The Temptations, The Columbus Jazz Orchestra, Steve Winwood, Vaughn Wiester’s Famous Jazz Orchestra, Afro-Rican Jazz Ensemble, Kico Cowan and Expresion Cubana, The Four Tops and The Spinners. Living in Columbus, Ohio for the past several years has enabled Bryan to dedicate himself more to composing and perfecting his craft. In High School Bryan was selected as a featured soloist with State Jazz and Orchestra ensembles. Having received the Louis Armstrong Outstanding High School Soloist Award and a scholarship to attend the Jamey Aebersold Summer Jazz Workshop, the saxophonist knew his purpose.